Maui ‘Alauahio or Maui “Creeper” creep along trunks, branches and twigs, flipping over bark and lichen in search of insects and grubs (insectivore): Click here to watch on Youtube. 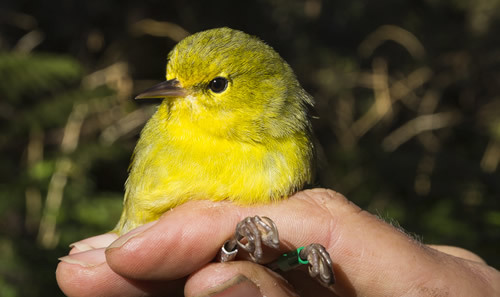 Similar to Hawai’i ‘Amakihi in appearance and behavior, they can be distinguished by lack of prominent black lores, a straight bill, and brighter yellow color. In 2013, graduate student Peter Motyka (NAU) began research with MFBRP to investigate the use of non-native forest by native birds. ‘Alauahio ‘helpers’ are usually offspring from the previous year and feed the female (their mother), nestlings, and fledglings. Fledglings are fed for two to three months, and young remain with their parents in family groups for 18 – 20 months! The ‘Alauahio contact call is a loud “cheep”. Their song consists of a repeated whistled phrase “whichy-wheesee-whurdy-whew”. ‘Alauahio forage among leaves and branches but occasionally creep over bark of larger trunks. They can be found in native forests and to a lesser extent in exotic tree plantations such as Polipoli Springs State Park and Hosmer’s Grove at Haleakalā National Park. They are bold and inquisitive, often approaching people in small flocks. Extinct on Lana’i, and extirpated from west Maui, ‘Alauahio now remain only on east Maui. They are fairly common on forested slopes of Haleakalā above 1,500 m.
Their future existence depends on conservation and restoration of malaria-free forest habitat. They are not federally or state listed as endangered but are considered threatened by the International Union for Conservation of Nature (IUCN).